I've posted the last of my Oshkosh pics on flickr. 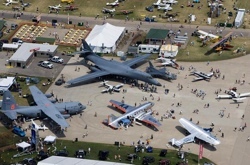 "Always innovative, EAAers embrace new tech in the campgrounds"
UCAP #39 "Welcome to Oshkosh!" UCAP #40 "Drinking Coffee on the Flightline"
I did an article about using technology in the campground. Things have come a long way since Geoff and his orange power cords. EAAers are innovators, and the rapid advances in communications and information technology of the past few years have been embraced by many of the Oshkosh faithful. Residents in the EAA campgrounds are using all sorts of devices and connections to enhance their enjoyment of the fly-in, and stay in touch with the outside world. And here are my columns from recent days. Hi, I'm still here. I'm doing a lot of writing. Just not here in the blog. Here are links to my latest Around the Field columns. Tue: Fathers and sons sharing their first visits to AirVenture … and accidental friends. "The exhilaration of flying is too keen, the pleasure too great, for it to be neglected as a sport." Here's my first column of the week. Here we are again. AirVenture 2007. It’s still early, but a steady stream of planes are arriving in the North 40 camping area. Wandering around the North 40, we see planes taxiing to their spots in the grass. Pilots exiting the cockpit to be greeted by the EAA volunteers. Camping gear being unloaded and assembled. And people standing beside their planes, squinting in the sun, looking around and surely thinking, "I’m in Oshkosh." This audio teaser for the latest episode of my podcast is created with a new website I've been working on. 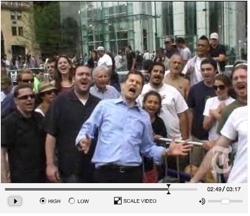 It's called Voxci and it lets you create an audio introduction to any webpage on the internet. Voxci is still in the very early stage of development. Alpha/Prototype. The basic features are there, but we have lots of ideas for making it look really cool, and add fun features. You can also visit the Voxci site to surf all the audios created by others. And, like YouTube, if you find one you like you can grab a link to send to a friend, or put the Voxci player widget on your blog or webpage. I haven't seen, nor heard the content of, the last Harry Potter novel, which is about to be published. 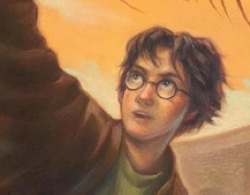 But before the whole world hears what happens, I want to go on the record on the subject of whether Harry will die in this final installment of the series. I believe that Harry must live. I think it would be exceedingly cruel to all the kids who have come to love this character. And I think it could damage the new-found love of reading which the series has created. On the business front, I think it would be foolish to kill Harry, especially at this stage of the business plan. There are still many movies to be made, possibly more related books, and endless branded merchandise. The Harry Potter Industry is set to keep chugging for years to come. Unless the customers lose the magic. And killing the beloved Harry would be just the way to cause the fans to turn their backs on the Harry world. It would be foolish to kill Harry. There is of course a middle ground, where Harry doesn't really die, but ascends to some higher plane. Sort of a Obi Wan Kenobi thing. But that's nearly as risky as having him die. Tricky to do right. The best thing is to have his finish off Voldemort, get the girl, and have the others come to a happy ending. And setup for the ultimate sequel series. Things are really starting to speed up in my world. 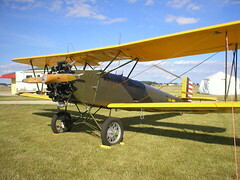 On Friday I travel to Oshkosh for the annual EAA flyin. I've got plenty to finish up before then. 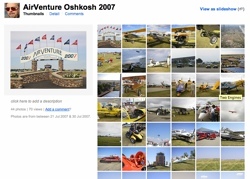 I planning on blogging AirVenture like I have in past years. This year I've added the podcast to the mix. Uncontrolled Airspace will be doing two episodes while we're out there. In addition to being posted on the net, both will be aired live on EAA Radio, similar to what we did last spring at Sun 'n Fun. Plus, I believe that EAA Radio also streams their signal on the internet, to anyone, anywhere could listen to the live feed of us recording the 'cast. What terrorism is really about. This article at Wired.com talks about a pretty interesting theory about what terrorism is really about. Luxury goods retailer Louis Vuitton has announced that it will not be the title sponsor for the challenger regatta at the next America's Cup. The winner of the recent AC regatta, Swiss team Alinghi, has tentatively announced 2009 as the date for the next edition. And it's so unnecessary. If only they were better managed. Eagle Tribune story. The thing is, this makes no sense. It's true that if Congress could force staffers to testify, that might inhibit their willingness to give frank advice. But if the President has to agree to their testimony, then they have no reason to hold back in advising him. My niece B is in the color guard of her high school band. They should do this kind of thing. This David Pogue musical tribute to Apple's iPhone starts out a little slow, but it really takes off about half-way through.